After polishing off my last Easter Egg on the weekend, I have made a little bit of a resolution to try and stay away from Chocolate. At least for this week....! Oh and if you are admiring my self control with still having Easter Eggs two weeks after the event - don't! You see I am one of 'those' still picking up the reduced chocolate during my weekly shops - please tell me I am not alone?!! So while I am not doing anything crazy like going totally sugar free, I am trying to include a few more nutritious snacks (snacking on chocolate is my biggest downfall) and trying oh so hard to eat less refined sugar. 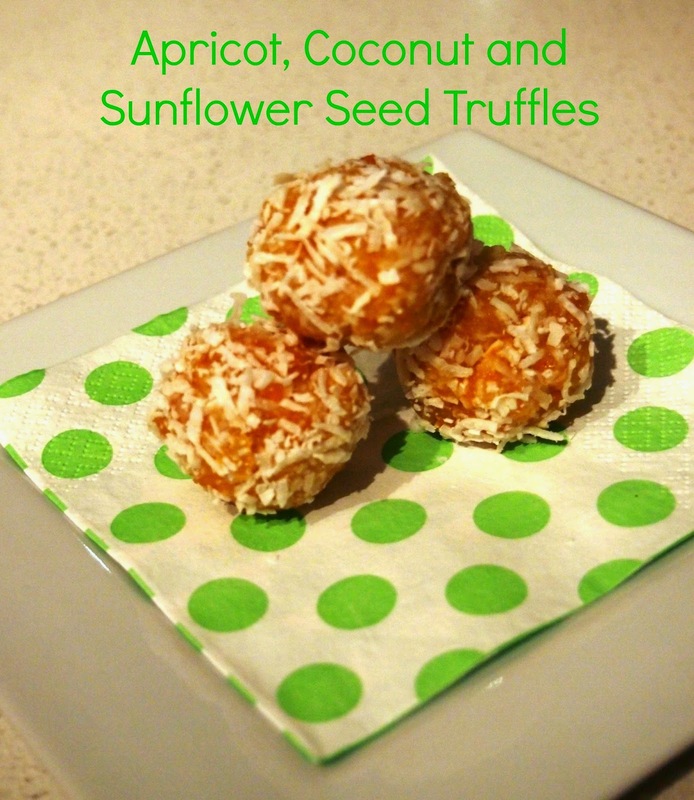 I whipped up these Apricot, Coconut and Sunflower Seed Truffles last night and they were too yummy not to share. For any of you on restricted diets, I believe them to be Gluten, Dairy, Nut and Refined Sugar Free and loved by little ones too if Mr B is any indication. If you have a Thermomix, this definitely makes the recipe a cinch. But it also works just as fine in a normal food processor too. Are you embarking on a bit of healthy eating after a crazy Easter too? !